By purchasing any of Spectrum Compact devices you also get a Spectrum Manager PC software that can be downloaded from SAF Tehnika website at no additional cost. This software was designed as a complementary addition to our Spectrum Compact devices, that allows working in both ways – with saved measurement data and direct control of the unit itself. It is helpful to be able to review gathered field measurement data later on the PC in the office, as the engineer might not have enough time or suitable weather conditions for detailed review right on the spot. With Save or Record function on Spectrum Compact, users can create data files, that later can be opened with SAF Tehnika’s Spectrum Manager PC software. Spectrum Manager’s post-measurement processing key features include placing of additional markers, adding GPS coordinates, zooming in on a specific range of the spectrum, calculation of power in band and spectrum mask function. Basically, all functions that are available on Spectrum Compact are also available on Spectrum Manager, plus few additional features as well. Set up to 10 MARKERS for input level measurements. 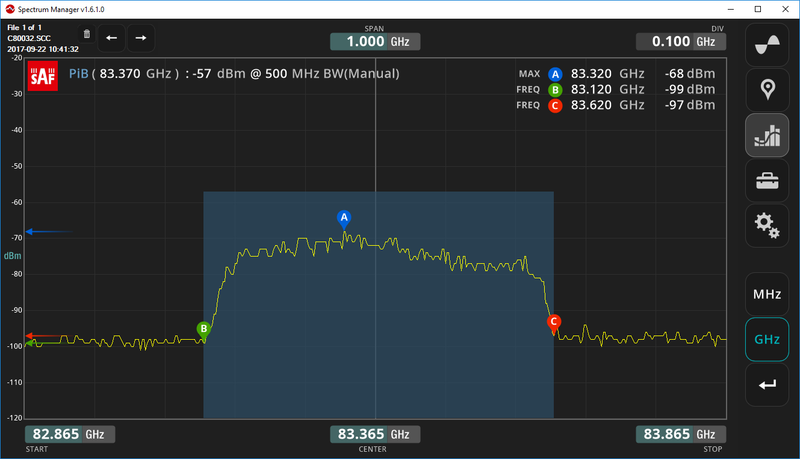 POWER IN BAND menu allows measuring input power for desired bandwidth (BW). Post-measurement review of spectrum scans can be used as a tool for sharing data among colleagues by having a visual reference of how different problems look like in the field. Another application for Spectrum Manager is a creation of reports. Users are able to create documents containing spectrum scans, information about the sites where measurements were taken, GPS location, or simply make images of the scanned spectrum. This enables users to build their own database about the situation in the field and track changes in the frequency range of their interest. Last, but not least is an option to control Spectrum Compact remotely from Spectrum Manager, in so-called “real-time” mode. This mode utilizes Spectrum Compact’s serial COM port connection via USB. During “real-time” session user can control the device remotely and change its settings – frequency, span, power in band calculation, etc. and receive updated measurement results right away in Spectrum Manager. For this mode user can create pre-configured profiles, which then can be loaded into software, thus switching to desired settings of the device all at once. Spectrum Manager allows connection to Spectrum Compact over Telnet protocol that enables to access device over internet or LAN. This feature is very useful in scenarios where Spectrum Compact is used for remote spectrum monitoring. Spectrum Manager software gives additional value to Spectrum Compact users by improving the use of current applications and offering additional ones. If you want to learn more about how Spectrum Manager can help you to improve working with Spectrum Compact, email me at Sorry, no go without enabled JS, pal. :(.